The eastern forehand grip is one of the easiest grips to learn. Roger Federer uses this grip but he modifies the grip a little. Apart from being easy to learn, an additional bonus is that this grip is very flexible so you can hit topspin by keeping the racquet face vertical or slice the ball by tilting the racquet upward. Also, it is simpler and quicker to switch to other grips from the eastern, so players are ready to face the next ball in no time. However, the eastern grip may not last long in rallies because of its flatter strokes and therefore more risky in long rallies. Many pros find that they can hit a more powerful topspin with other western grips, therefore the fame of the eastern forehand has been reduced at professional level. Like I previously mentioned, one can produce a more powerful topspin from the semi-western grip with more control compared to the eastern grip. One example of a tennis pro who uses the semi western grip is Andy Murray. This grip is also great for balls coming at short angles and lobs. Plus, it allows the player to take a good swing at the ball as topspin will keep it in the tennis court. Even though the semi western grip is great for high shots, the same can’t be said about low shots. Another limitation is that it can also be difficult changing the grip to a continental grip for shots like volley. However with plenty of practices and sound footwork, these limitations can be taken care of. The western forehand grip is favored by players who like to regularly hit tremendous topspin. One great example is Rafael Nadal. This is a no surprise because this acute grip is packed with heavy action. In addition, this grip has a strike zone high and far out in front compared to other forehand grips. The weakness of this grip is that you need a strong wrist and fast racquet-head speed to make it work. Also, like the semi-western grip, it is difficult to switch to different grips quickly. 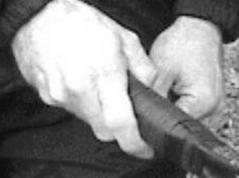 An old school type of forehand grip which is why I use a black and white picture. This grip died out when wooden racquets ceased being used. However, in the era of wooden racquets, this grip was very popular with everything. In modern tennis, a tennis match consists of superior pace and higher bouncing balls so this grip is not useful. Therefore I will not recommend that you try this grip for your tennis forehand at all unless you want to execute a forehand slice. Grips are important because it is the deciding factor behind your stroke. Each grip can produce a different stroke, spin and placement of shot. Practice every grip and try to remember each one’s advantages and limitations so that your forehand will be your strong weapon. From "Which Forehand Grip Should You Use" To "How To Play Tennis Efficiently And Become A Better Player"